One of my favorite party appetizers involves pickled veggie wrapped in cheese and meat. 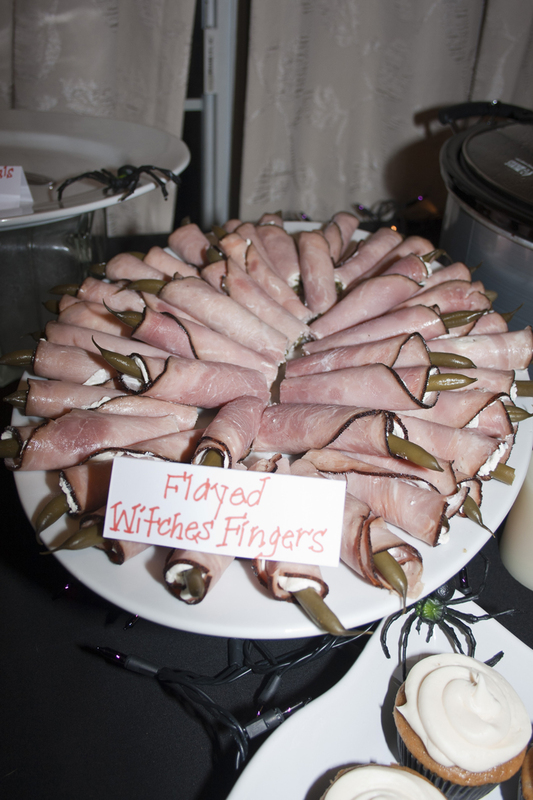 These Flayed Witches Fingers are easy to whip together with all store-bought ingredients. I used a jar of pickled green beans I got from my mom-in-law, but you can easily use jarred asparagus from your local supermarket. Slap some softened cream cheese on deli ham and roll it around your veggie. They are sure to thrill all your ghosts and goblins! If you cut each finger into fourths and remove the gross sign, these are a great appetizer for any party. I’ve made them for football games and New Year’s Eve. They are always a big hit! Spread each ham slice with about 1 tablespoon cream cheese. Place 1 asparagus spear along the lengthwise edge of ham slice. Roll up jellyroll style. Wrap; refrigerate until ready to serve.